It's a new semester on the island, and Drew has a new roommate, Mei-Ling. She's different from the other girls as she didn't chose this life. The vamps stole her as she has something they covet. Knowing the girls on the island will chew her up and spit her out, Alex is determined to look out for Mei-Ling. But babysitting her roommate is the least of her problems. Since rescuing Master Vampire Carden in the previous installment, Alex has been trying to figure out the bond between them. All she really knows is that she craves him in the worst way. So when bodies start showing up drained and Carden is accused, Alex is determined to do everything she can to clear his name and keep him safe, even it if mean risking her own life. The plethora of potential love interests seemed to settle down a great deal in Blood Fever. Some faded to the background as the relationship dynamic changed more to allies rather than attraction. Another seemed to be on the brink of dissolution, which considering the circumstances, isn't really a good thing, at least not where Alex's safety is concerned. But one came firmly to the forefront. Since the vamps in this series are cruel and manipulative without a romantic bone in their bodies, I never thought I would actually be rooting for Alex to be with one. However, that being said, Carden is quite different than his counterparts, and it makes me wonder if there are other more "human" vamps out there. Perhaps the ones on the island (and the ones she encountered on her mission) are just an evil bunch. Just like humans can be good or bad, perhaps the same applies to the vamps as well. I still don't really understand the purpose of the island although I do have theories. Why do the vamps even need the Watchers to be warriors? They are supposed to be so strong, why do they need humans to protect them? Why they train these girls to be able to outmaneuver them is beyond me. Perhaps they are just that arrogant that they don't believe one of them would be capable of doing so. Even so, it just strikes me as odd that they don't just train them in obedience, manners, and poise. Considering how much the vamps like to be in control, you would think a warrior wouldn't make for the perfect companion. Perhaps it is a status thing to have the cream of the crop, but honestly I have a feeling it will come back to bite them in the behind one day. Perhaps our dear Alex will be the one to take them down and show them the error of their ways, and I will be cheering for her all the way. Alex really shines in Blood Fever, even as her personality traits were laid bare in front of her. She has managed to hold true to her humanity even as she continues to play the deadly game of survival that the island holds. She really stands above the rest of her peers as her iron strength and will has not turned her cruel. She still has compassion, although the vamps do their best to stomp it out. That more than anything else is what makes this series so very enjoyable. With each book released in the Watchers Series, I only become more invested. 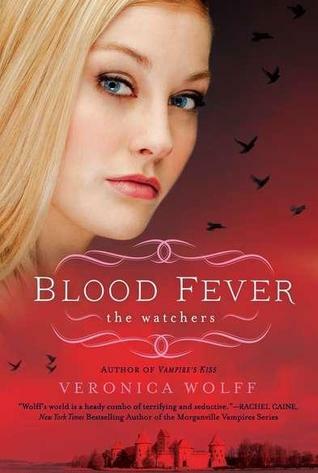 Blood Fever was no exception as it takes everything that I loved from the first two installments and only made it better. Definitely a must read!